The Middle East County Board committee is made up of representatives from a selection of clubs across the region. The ME Board meets on a regular basis, working to support and promote all aspects of the development and progression of our Gaelic Games across the region. If you have any queries related to any specific areas of GAA in the region, please do not hesitate to contact the relevant county committee officers â contact details are included below. Originally from Balinabrackey in Co. Meath. I was lucky to play in the golden era of Meath football and played against many of my hero's like Colm O'Rourke, Mick Lyons, Martin O'Connell, Robbie O'Malley and Brian Stafford. Moved to the Middle East about 12 years ago and was one of the founding Members of the Arabian Celts GAA Club in Bahrain and served as Chairman for 4 years before becoming the Club President in 2013. Helped set up the Middle East League with Paddy Darcy, Dubai Celts, Liam McAulliffe, Clann na hOman, Barry O'Sullivan, Qatar GAA & Gary Tracey, Abu Dhabi Na Fianna back in 2010 and am constantly amazed how successful the League has become since those early days. I served as the Sponsorship Officer on the Asian Gulf Board in 2012 before we set up the Middle East County Board in June 2013. I was very proud to be elected as the 1st Chairman of the Middle East County Board and am delighed with the hardworking and enthuastic Committee we have working on the County Board. My hopes for the future are to see the continued development of Gaelic Games in the Region and to ensure that all 6 Codes of the GAA, Gaelic Football, Camoige, Hurling, Handball, Rounders & ScÃ³r are in place across all Clubs in the Middle East by the end of 2014. GAA Career defined at club level with Droim Dhuin Eire Og GAA Club Cavan, with club honours at League and Championship level in Cavan and Sigerson Cup representation with TCD. Represented Cavan GAA at underage and adult level before emigrating in the late 1980âs. On returning in the late â90âs became active on and off field, having served as home club PRO, Treasurer and Chairman as well as County Committee and Ulster Council. Currently Chairman of Naomh Alee in Riyadh and Treasurer to Middle East Co. Board. Family connections with home club and Cavan continues with wife Breda the current Droim Dhuin Treasurer and sons playing Sigerson Cup and County football with Cavan. 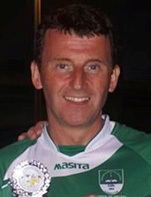 I moved to Dubai in 2004 and have played with Dubai Celts, as well as coaching both the Men's and Ladies teams down the years. I acted as Chairman of the club for 2 seasons, and am on my second year as Secretary on the Middle East County Board. In Ireland, I play football, and a tiny bit of hurling with Dunderry in Meath. Living and working in the Gulf region for over eight years, SinÃ©ad has been involved in all aspects of GAA life here to date. Having been a player and member of two of the largest clubs in Middle East GAA, Abu Dhabi Na Fianna & the Dubai Celts, SinÃ©ad now resides in Bahrain and is involved in playing and at committee level with the Arabian Celts. She has also served as a member of the Bahrain Irish Society committee and has been involved in the development of the Bahrain Irish Business Network. Coming from the other Great Kingdom, Kerry, her home club is the Listowel Emmets. I moved to Bahrain in June 2011 to work from ESB International. Since then I have played football and hurling with the Arabian Celts, acting as captain of the Men's A team for the past two seasons. In June 2013 I assumed the role of Chairman of the Arabian Celts club and was elected as Coaching and Games Development Officer for the Middle east Board upon its foundation. Club afflication here is the Arabian Celts. In Ireland I play football and hurling with Moylagh C.L.G in Co. Meath. I am from West Cork and moved to the Abu Dhabi in 2011 to work in a local private school teaching secondary PE. Started playing with Na Fianna within four days of arriving in the country! Played club football with Gabriel Rangers at home in West Cork where I also coached and refereed underage football. I played college football with University of Limerick during my four years there studying Physical Education and Geography. Since moving to the Middle East I have found the GAA very important to both being able to settle in to my new environs and to maintain a link with home, therefore when the opportunity arose to join the county board as Hurling Development officer in 2012, I was more than happy to take it on and do my bit for the advancement of GAA in the Middle East and that plenty more people would have the same things I have had the privilege of experiencing. Middle East Club: Dubai Celts / Irish Clubs: Carlow Town Hurling Club & Palatine GAA. Residing and working in Abu Dhabi since 2010. 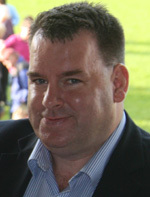 Brian has been an active member of the successful Na Fianna GAA club over the last three years. 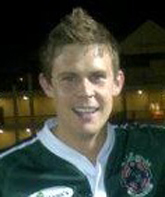 Prior to arriving in the Middle East, he won an Australian GAA State Games football medal with the State of Victoria in 2010. He played hurling and football with St. Patrick's College, Drumcondra winning Ryan and Trench Cup medals. He transferred to Dublin club, Erin's Isle, Finglas after playing hurling and football underage with his native parish of Corofin, Co. Clare. 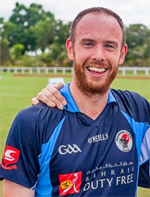 He is currently working on promoting our national games in his voluntary role as the juvenile development officer for Na Fianna Ãg and the Middle East region. He is also a member of Abu Dhabiâs hard working Irish Society. 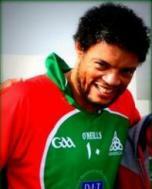 Cormac is a member of the Arabian Celts GAA Club. Although he still plays, he is currently focused on the club's underage. 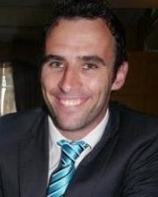 Cormac is a Leinster GAA tutor and has coached teams at Ballymun Kickhams, Blanchardstown IT and Caragh GFC in Co. Kildare. Cliodhna Healy is the chairperson of Al Ain GAA. She has been living in the Middle East for the past two years, working as Head of Faculty in a school in Al Ain. She has been affiliated with several GAA clubs from Glasgow to Sydney and from Dublin to her home on Achill Island. She is delighted to be involved in the development of the GAA in the Middle East.